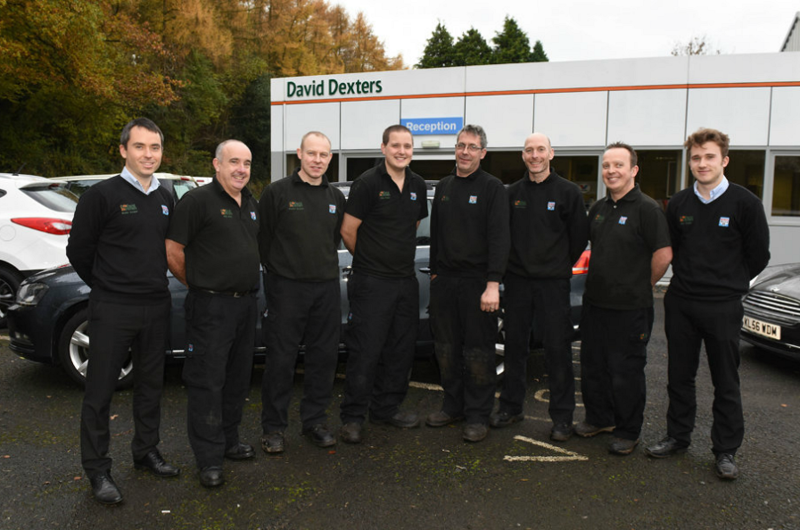 Customer service is at the heart of all we do here at David Dexters, and that’s why it’s so important for us to have the right staff. As well as being friendly and knowledgeable, our team members are all experts in the job they do so they’re able to complete any task, big or small, efficiently and correctly. We’re aiming to introduce you to the people behind David Dexters, to give you an insight into their working lives and how they came to be part of the team. In this, the second of our staff spotlight blogs, we’re focusing on Darren Williams (fourth from the right) – who is a vehicle and diagnostic technician as well as being an MOT tester. It sounds like a busy job but what does he do on a daily basis? Firstly, Darren is one of a team of people who’ll be looking after your car when it’s booked in for an MOT. He’s also our go-to man when anything out of the ordinary needs solving. Before joining us in 2008, Darren had worked for the AA for a decade so he was well practised in diagnosing all sorts of issues. “I tend to deal with anything that’s not run of the mill. Days are varied because although there are always a certain amount of MOTs, we never know what’s coming to us in terms of breakdowns,” he says. Darren made the decision nine years ago to give up the shift work associated with his former job to spend more time with his wife and four children. We took him on and were extremely impressed with his work. For the past three years he’s been working towards becoming a Bosch accredited diagnostic technician and once he’s completed his final exam, he’ll spend the following two years becoming a master technician. “It’s a nice place to work,” he says. ‘I like the fact you don’t know what you’re going to get from day to day. So if you bring your vehicle to us – for it’s MOT or after a breakdown, Darren will be part of the team taking care of it for you. Keep an eye out over the coming months for more staff spotlights from different areas of the business.